An associate's degree from a small technical college in South Dakota is proving to be more valuable than a degree from some four-year schools. On campus at Lake Area Technical Institute, students are operating excavators. Others are working on the engine of a 727 airplane. Future nurses are learning how to draw blood from a patient. And almost all of them will leave school with a job. Lake Area Tech has one of the highest job placement rates among community colleges across the nation. About 99% of graduates have jobs or are continuing their education within six months of finishing their program. They're predominantly employed, President Michael Cartney told CNNMoney. "We define success as placement. Graduation is a step along the way," he said. Lake Area Tech was named the top community college in the country this week by the Aspen Institute. The $600,000 prize for community college excellence is based on factors such as graduation and job placement rates, how much alumni earn in their new jobs, and how many low-income and minority students enroll and succeed. The hands-on experiences are, in part, what prepares Lake Area Tech students so well for the job market. "I never felt like I was learning for an exam. I always felt like what I was doing was going to be applicable at some point in my career," said 2015 graduate Vincent Henningsgaard. He had a bachelor's degree in theology before enrolling in Lake Area Tech. But after spending a couple of years at a monastery, he wanted a life change. As soon as he graduated from the energy operations program he stepped into a job as an IT specialist. He works for a company that sends electricity from dams along the Missouri River to homes and businesses throughout the region. "If something goes down, I'm one of the people they call to bring it back up again," Henningsgaard said. 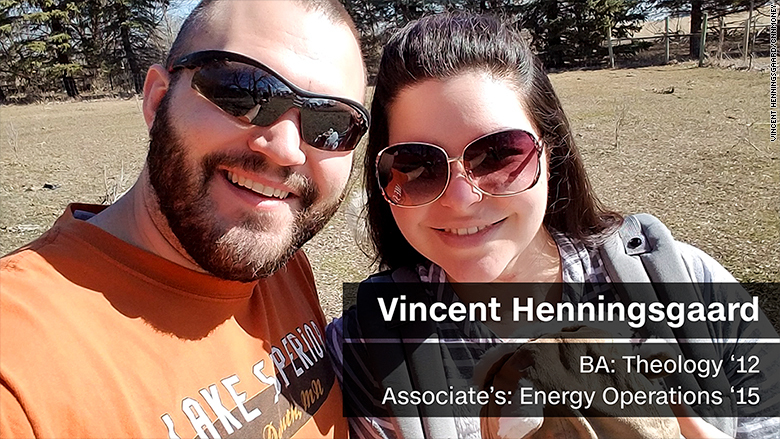 Vincent Henningsgaard returned to school to get his degree in energy operations. He landed a job before graduation. The energy technology and operation programs -- training students to build and run equipment at energy plants -- and the robotics programs are currently the most successful at Lake Area Tech when it comes to placing students. On average, their starting salaries are already a little higher than South Dakota's $50,000 median income. Partnering with leaders in local industries is key. Lake Area Tech invites them to sit on advisory boards to review curriculum, making sure students are learning the skills they'll need in actual jobs. 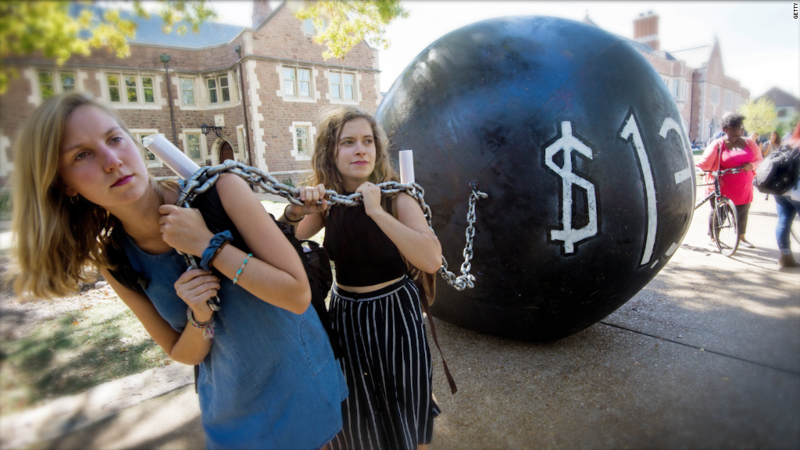 Some provide funding for scholarships and offer internships. Others provide equipment students can use in the classroom. FedEx, for example, provided the school with the 727 airplane to help train aviation mechanics. Lake Area Tech is small, with fewer than 2,000 students. But the high job placement rate is significant, especially considering how many of its students graduate on time. Nationally, just 39% of students finish or transfer, while 74% do at Lake Area Tech. The Aspen Institute awards the prize every two years to help successful community colleges serve as a model for others and show how they can create an important pathway to better paying jobs for Americans. That's one reason Kelsey Stoltenberg enrolled in the nursing program at Lake Area Tech. At an affordable price of less than $12,000 total, the 11-month program wouldn't require her to spend too much time out of the workforce or away from her family. And she'd walk away with skills needed to land a job. "I wanted to find something in high demand. And nursing has kind of been in the back of my mind since I graduated," she said. 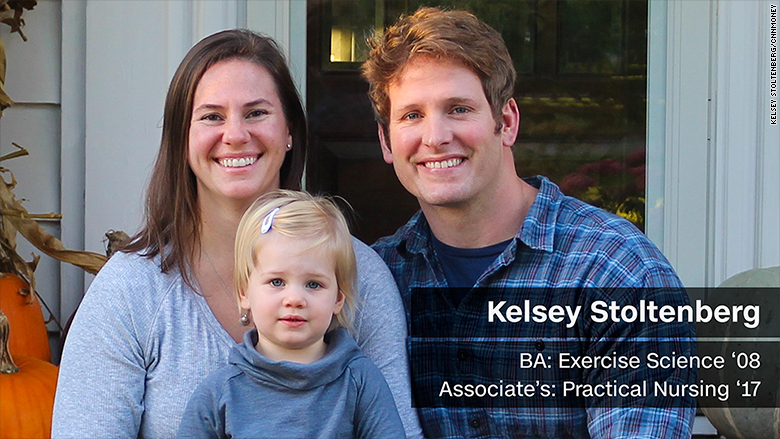 Kelsey Stoltenberg wanted a degree that's in high demand and wouldn't keep her away from her family for too long. Stoltenberg received her bachelor's degree in exercise science from South Dakota State University in 2008. But she's been job hopping ever since -- from personal trainer, to researcher, to an insurance company's paramedical examiner -- struggling to find a satisfying, steady career near her family. The economic downturn brought more students to Lake Area Tech, including many who had four-year degrees and still couldn't find a job, Cartney said. Entry-level jobs often require a specific skill set now more than ever. Lake Area Tech aims to fill that skills gap. "What people need to know to get that entry level job is much more than it used to be," Cartney said. The state of South Dakota has also recognized the success of technical programs. They've partnered with a philanthropist and a variety of companies to offer the Build Dakota Scholarship Fund, aimed at alleviating the workforce shortage. It offers a free ride to about 300 students each year who are enrolled in certain programs at Lake Area Tech or the state's three other technical colleges. Recipients commit to living and working in the state, in their field of study, for three years following graduation. Some scholarships come with industry partners, who provide on-the-job training or part-time jobs while in school -- which could lead to a full-time job. It's not guaranteed, but there's usually an agreement that says the student will get a job if they're in good standing at the time of graduation. "Students now realize that a tech school isn't a lesser education. It's more hands-on and it's rigorous," Cartney said.